The perfect winter mountaineering softshell…? I own every model of the Rab Vapour Rise series, they just seem to work really well in the UK environment. For those that are unfamiliar with the concept the Vapour Rise is what is known as a shelled microfibre softshell. The outer is a Pertex shell and the inner a micro fibre fleece that has a high wicking ability as well as being insulating and warm when needed. I don’t know what it is about them but they have always worked well for me, I can sweat like a docker on the approach and arrive dry. It can rain quite heavily and although the outer wets through I’m warm and only a little damp on the inside. 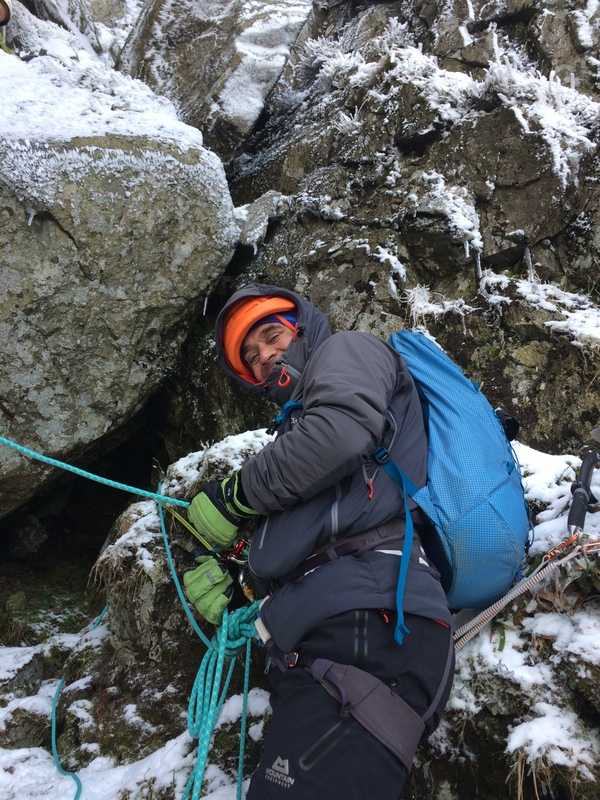 The system seems to be the perfect jacket for our damp UK climate and they are my jacket of choice for instructional work as well as my personal alpine and winter climbing. I love my VR (which is what we call Vapour Rise) Alpine which I have a great bright green colour (bring that back please Rab as I’ll need to replace mine soon).B ut when the temperatures plummet and my dreams turn to winter climbing then it’s the Rab Vapour Rise Guide I turn to. 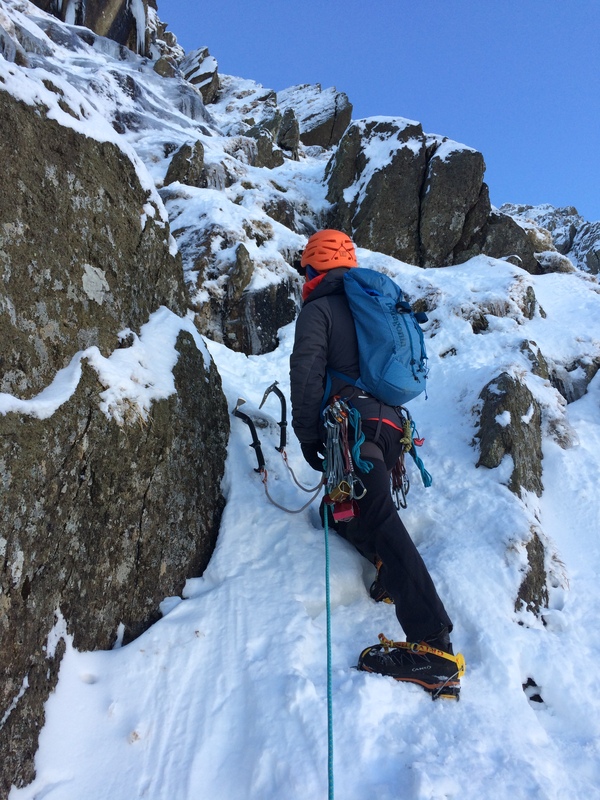 When the weather turns icy and cold the Rab VR Guide is perfect. I’ve owned all three models of the VR Guide and I must say Rab have done a fantastic job with the new update. Sleeker, lighter and using the new Polaretch Alpha we’ve been raving about all year it’s a near perfect jacket for all your winter mountain adventures. You could get warmer by maybe using a Bufalo or Montane Extreme but I have found them too hot and very restrictive for climbing in. The outer fabric on these types of jacket are less ventilated than the VR Guide and I have found they are more suited to extreme cold environments like Scandinavia and where you are hanging around a lot more. What more, the VR Guide looks more like a climbing jacket and layers up better – that is you can wear a thin base layer (you won’t want more than that) under it and for slightly milder conditions a wicking t-shirt worked well and even next to skin. OK, so what improvements have Rab made to the new Guide jacket. The jacket is way lighter than my Guide Mk 2 jacket and as it uses Polartec Alpha insulation. We first reviewed this in the Rab Alpha Direct jacket earlier in 2017 and we’ve been very impressed with its wickability and warmth. The Alpha works really well with the Guide jacket as it adds plenty of warmth for very little bulk and the newer Guide model seems much less bulky to wear and makes the jacket feel more streamlined when wearing it, especially with a harness. There is a great, large chest pocket that swallows everything including a full OS map if you are carrying one of those (I use mine for stashing gloves in when setting up belays, etc). Rab have dispensed with one of the internal zip pockets so there is now just one on the left hand side and two large handwarmer pockets that are slightly slanted (Rab call them A line pockets). Those who read a lot of my reviews will know I’m not a huge fan of handwarmer pockets on climbing jackets (the VR Alpine just has 2 chest pockets that work brilliantly with a harness) but they add a little hand warmth on a cold approach as well as extra ventilation on those milder days. Extra ventilation is provided by the two large pit zip that did back surprisingly easy – which is unusual as they are normally a total pain. The Pertex Equillibruim outer has been the mainstay of the Vapour Rise range since its beginnings. It hard wearing and very breathable and Rab have made a good choice with their ‘…if it ain’t broke don’t fix it’ philosophy to the range. It really is amazingly breathable and the DWR will shed a reasonable amount of rain. Talking of which – it’s very rare that I’ve ever had to wear a hardshell with any VR jacket I’ve worn and I only ever take out my lightest hardshell (which is more about staying warm in super windy conditions than about getting wet) as I’ve worn all my VR jackets in a variety of rainy conditions and always seemed to stay dry. It’s like some sort of witchcraft! The helmet compatible hood is super cosy for belaying. But don’t panic if the conditions turn gnarly, the reinforced shoulders will shed any amount of hideous Point Five spindrift and the hood is just awesome. I can either just pop t up on the belay for some added comfort or batten down the hatches and make yourself nice and cosy with the great chin guard. The hood gives a reasonable about of 180 visibility as well as flexibility when looking up for that next axe placement. The hood can be rolled up when not in use using the velcro flap – I’ve cut these out of every jacket I’ve had and will probably do so with this. But at least it’s an improvement on the zipped collar of the first models! The hem cinches up using the easy to use cordlocks and the sleeves have glove friendly velcro tab closures. Feel free to sweat away, the Rab VR Guide will wick it away quickly, leaving you dry. 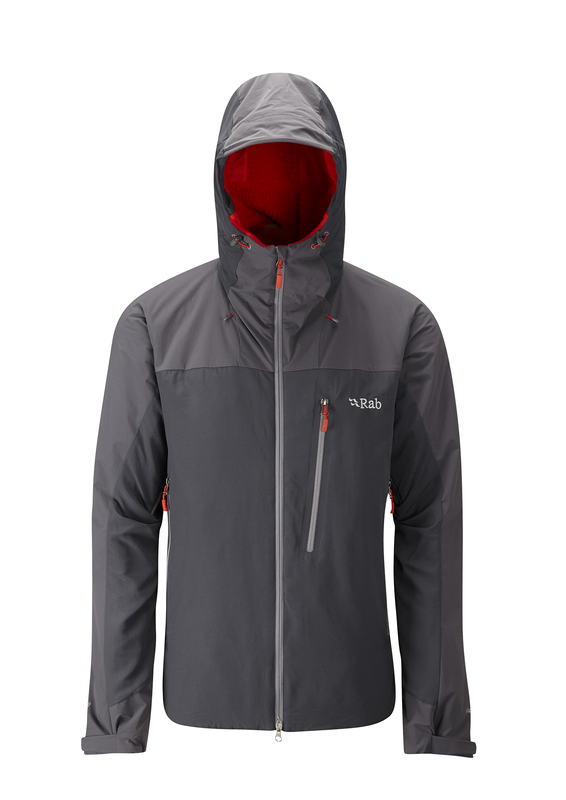 Have I raved enough about the Rab Vapour Rise Guide jacket it yet? 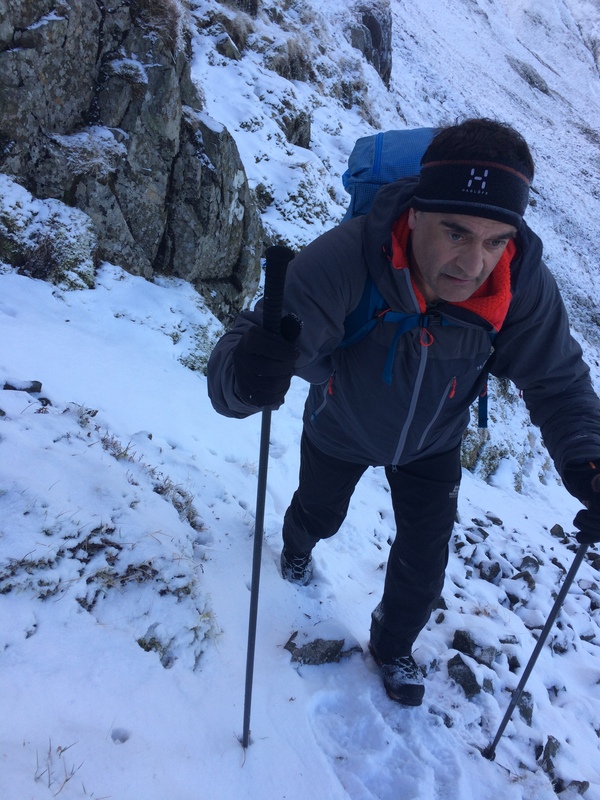 As a Mountaineering Instructor I have found all the VR jackets brilliant in use and are ideal for UK and Scandinavian mountaineering where any day out is likely to be quite damp. They have been an iconic jacket for many years and the Guide certainly deserved the title of classic Scottish winter jacket – I can’t think of a better jacket I’d be wearing on a Ben Nevis day out. Get out the car, put on this jacket and keep it on all day, whatever the conditions throw at you! Unfortunately the Rab Vapour Rise Guide jacket only comes in colours Black and Grey (some brighter colour for 2018 please…?) and sizes S – XXL. It’s a regular fit so will work well with a baselayer and will feel comfortable all day. Available direct from Rab and all good climbing shops.